"The development of OS X Snow Leopard appears to be entering the final phase. Apple asked a select group of developers to test the latest build against a number of third-party applications and some claim the final version will include location-based and multi-touch technologies. In any case, OS X Snow Leopard is now on the horizon and some think that Apple will time the release to coincide with the next iMac hardware update. Despite its lack of major end-user features, Snow Leopard could be the biggest OS X update ever thanks to one killer feature - speed and performance that will take everyday computing to the next level...."
"Apple's Mac OS X 10.6 Snow Leopard operating system will include tools borrowed from the iPhone that let developers determine the geographical location of Macs, as well as extend additional support for multi-touch to their apps, AppleInsider has learned. "People familiar with the latest pre-release distributions of the next-gen OS say the software now includes the CoreLocation framework previously available via the iPhone SDK, which will allow Mac applications to identify the current latitude and longitude of the Macs on which they're running...."
"The new 'Learn to Play' downloadable lessons in GarageBand are only supported by Apple on Intel-based Macs. When PowerPC users go to the lessons or the lesson store, they are presented with a message that states an Intel-mac is required. Despite this, non-Intel users can get lessons to run...."
"As Apple continues a march toward all Intel-based computers, those hanging on to perfectly good G5 and G4 computers are left to watch features slowly bleed off. "In the recently released iLife '09 package, iPhoto has left some owners of older Macs wondering where their slide show transitions have gone. "Apple has now released a support document detailing what is missing...."
"According to a recently unearthed Apple Knowledge Base Article, you PowerPCers out there aren't getting the full iPhoto '09 love when it comes to transitions effects. G4 users only get Ken Burns and Classic. G5 users get Classic, Ken Burns, Scrapbook, Sliding Panels. Intel owners get the whole nine. "The number of slideshow themes available in iPhoto '09 depends on your Mac's processor and, in some cases, available vRAM...."
"They ship their Macintosh clones to Belgium, Denmark, Finland, France, Greece, Ireland, Luxembourg, Italy, The Netherlands, Austria, Poland, Portugal, Sweden, Spane, and the UK. "Basically, it reads that end-user license agreements in Germany are only valid if they have been offered before the transfer of goods/money, which in the case of Mac OS X does not happen. As such, PearC claims, the clause in Apple's EULA binding Mac OS X to Apple hardware is unlawful...."
"Looking to succeed where Psystar has drawn massive litigation, Germany's PearC is now offering Macintosh clones for sale...at least for a while. "Apple has so far declined to comment on PearC's offerings." "We're never going to get tired of the insane legal theories would-be Mac clone companies trot out to try and circumvent incredibly basic copyright and contract law concepts - like Psystar claiming Apple has a monopoly on its own products - and today we've got German cloners HyperMeganet, who'll sell you a 3.2GHz Core i7 Blu-ray-equipped PearC tower with Mac OS X preinstalled for €2,408 ($3,111). According to the wonderfully-named Hypermeganet, German law requires EULAs to be available for review before purchase, so Apple can't enforce its license restrictions since the Mac OS X EULA isn't printed on the outside of the box...."
"Intel on Tuesday accelerated plans to release two dual-core laptop and desktop processors, tweaking its road map as it juggles manufacturing efforts to cut costs. "The company will ship dual-core processors for mainstream laptops and desktops made using the 32-nanometer process, skipping plans to release similar chips manufactured using the 45-nm process. "The chips will ship in the fourth quarter . . . be cheaper to manufacture, work faster and draw less power." PR: White on Red American Apparel 2001, Fine Jersey, Short Sleeve T-Shirt. 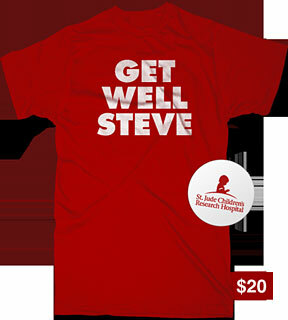 All profits from this shirt are donated directly to St. Jude Children's Research Hospital. PR: LifeWay Worship has unveiled the latest innovation in digital music: SongMap, a web-based application that allows users to create custom arrangements of songs and produce corresponding audio files and sheet music. SongMap was developed through the largest known recording project in Nashville history. Nearly 1,000 songs and 8,000 mixes were recorded in just 10 months by over 150 professional musicians, vocalists, and engineers. The technology was unveiled at an inaugural ceremony at LifeWay's corporate headquarters in Nashville, which was attended by Christian and mainstream music industry executives; worship and music ministers; and government and civic leaders. It became available for public use Monday, February 9, 2009. SongMap is the first web-based technology that allows users to choose specific sections of songs: verses, choruses, transitions, and more - in the keys they prefer - and then download sheet music and audio files that correspond to the custom arrangement. The technology was developed specifically to meet the needs of worship leaders who want more flexibility arranging songs for church services. At the same time, SongMap has broader implications throughout the mainstream music world. "SongMap is the first technology that gives users the ability to change songs on the Internet to meet their own tastes," said Mike Harland, director of LifeWay Worship. "Some churches need sheet music for a full rock band each week, while others rely solely on accompaniment tracks. We set out to find a way to help these churches create music that suits their congregations. In doing so, we created a new music technology that does what none other has done before." Three years in development, SongMap was created by a team of software engineers and music industry professionals. It is the signature product of the LifeWay Worship Project, a ground-breaking set of new products that includes hymnals, PowerPoint presentations, video and audio files, and sheet music. As part of the project, the LifeWay Worship team gathered a lineup of over 150 professional musicians, vocalists, and sound engineers to produce recordings of up to 8 recorded formats of more than 900 of the most loved church songs in just 10 short months. The selection ranges from traditional hymns to contemporary worship songs, as well as standards such as "America the Beautiful". The production team then divided the arrangements into more than 500,000 individual segments. From these segments, the SongMap technology allows users to "map" custom mixes of individual songs. Though sophisticated on the back end, SongMap was designed for use by anyone with an Internet browser; users simply register free of charge. The cost to map a song ranges from $1.49 to $1.99 per part. Once a song is purchased, the user has immediate access to the corresponding MP3 file and sheet music, and the custom file is stored in the user's online media library for future use. Starting February 9, 2009, LifeWay Worship will have over 100 songs available for mapping and will continue to add "mappability" to its products on an ongoing basis, including new release titles. 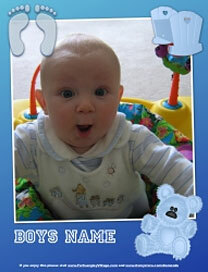 Registered users will receive regular updates as this occurs. LifeWay Christian Resources is one of the world's largest providers of Christian products and services. As part of LifeWay's church resources division, LifeWay Worship developed the Worship Project to provide churches of all sizes a unique, cost-effective, holistic package of worship planning tools that includes hymnals, sheet music, accompaniment tracks and videos. 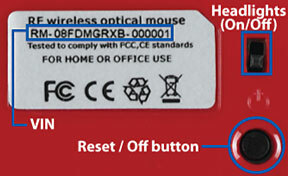 PR: The original Road Mice Car Mice are "Officially Licensed", optical wireless computer mice with the look of a replica automobile and the functionality of a top pointing device utilizing the latest RF and optical technology. These unique mice are high performance accessories with 800-dpi resolution for enhanced accuracy and precision movement. The functioning headlights and smooth lines help give the car a realistic look and feel. So sit down, buckle up, and "Cruise the Web in Style! " Then enjoy the ride. PC and Mac compatible. 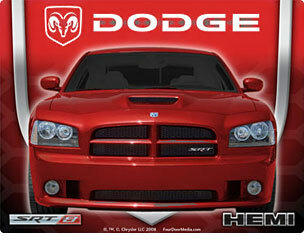 Road Mice's custom, licensed mouse pads are the perfect accessory for your Car Mouse. Brand the mouse pad with the logo of your choice, so your Car Mouse always has a smooth surface on which to cruise the Web. The custom mouse pads are sure to rev-up any desk. 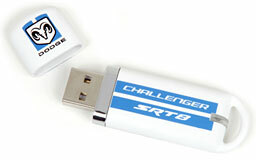 Road Mice's high performance 2GB USB flash drive is reliable and easy to use. The drive is branded with a product logo to ensure that your brand accompanies you on any drive. It fits nicely on a key chain, center console, glove box or just about anywhere. The flash drive is designed to securely store and transfer important data, songs, photos and more. Drive across country, across town or across platforms in a flash. Ideal for use at home, work, school or anywhere on the go. The Title and Registration system enables new Road Mice owners to register and activate their product warranty. Upon completion you will receive your unique title (free & clear!). Visit RoadMiceTitle.com to register. The unique VIN number is a great way for collectors and enthusiasts to ensure that their car mice are properly documented. The Title makes for a great keepsake for mouse drivers of all ages. Moreover, collectors will find the unique VIN, with accompanying title, a great avenue for increasing the value of their prized collection. Road Mice Gift Certificate includes "ground" shipping anywhere in the continental US. Not quite sure about the exact make, model, color or design for your friend, colleague or loved one. Road Mice Gift Cards are the perfect gift for any occasion. Flexible and convenient, they're sure to please any car or computer aficionado on your list. Guaranteed to be your simplest car-buying experience ever. 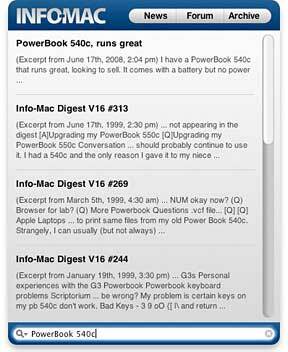 PR: With the new Info-Mac widget for Mac OS X you can not only get Apple and industry headlines on your dashboard, but follow Forum activity, and even search Info-Mac in its entirety (News, Forum, Archive and even Digest) and get the results right inside the widget without ever leaving the Dashboard. 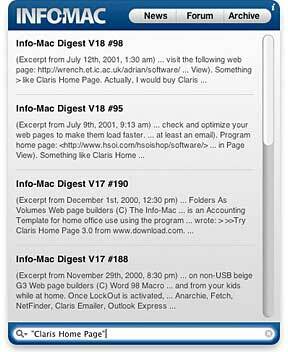 This can be an especially useful tool for both new and old Mac users alike, especially once we have the full Info-Mac Digest going back to 1984 online (so far only about 30% is online). 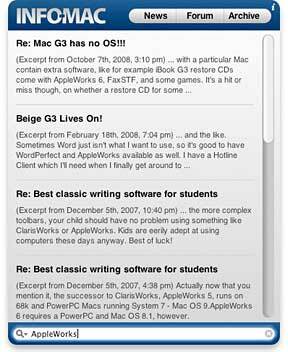 Searching Info-Mac for "AppleWorks" with the Info-Mac widget. Searching for the PowerBook 540c - or "Claris Home Page" as a phrase. 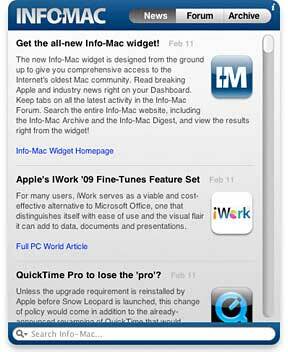 The Info-Mac Widget is free. Jason Hughes writes, "Created a bunch (50+) and thought you might like to let your Mac followers for your website know. Add our link if you wish, or pass it on to some one you think would like it." PR: This program allows you to remove your emails directly on the server. It can raise several accounts at the same time. History is not deleted when quit MyPopBarrier (old removed messages are removed, see slider history size). System requirements: Mac OS X 10.3.9 or later.